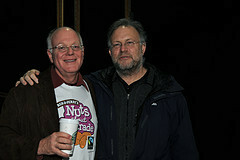 In town for their Free Cone Day ice cream give away, Ben Cohen and Jerry Greenfield (more popularly known as Ben & Jerry) took the opportunity to announce their commitment to go 100% Fairtrade. By 2012, every ingredient that goes into a Ben & Jerry's product will be Fairtrade certified. Nice one. Braving the seemingly weather impervious crowds queued up for free ice cream and entertainment, Londonist popped round Leicester Square this morning to get the scoop from this duo of ice cream aficionados. A long way from the hippie-humble beginnings as a Vermonter sole trader start-up, today Ben & Jerry's Homemade Holdings, Inc is a division of the British-Dutch Unilever conglomerate. Still, despite the multi-national corporate trappings, these jolly and refreshingly straightforward buddies have a fun and good natured sense of perspective. Here's our interview. So, what do you two think about London? compared to New York (well, take any city compared to New York) it's much more beautiful. Jerry: We're staying at the Charlotte Street Hotel. You know those headless, armless female mannequins for dressing? Well, there's one in Ben's room. We had a photo shoot there yesterday, and during the shoot Ben was really getting into that mannequin. The shoot was for the FT. We're not sure if those particular shots will make it into the piece or not. But another thing about London is that for a long time in America it's had a reputation for bad food. I definitely don't think that's the case anymore. We went out for dinner last night to Ping Pong and had a great time. Why did you choose London to announce your commitment to go 100% Fairtrade by the end of 2011? Jerry: Well, “our people” actually chose London for us. But the reason behind the decision was because awareness about Fairtrade is so high and advanced here. Ben: In Europe, the UK is the most advanced in terms of market penetration. Jerry: After London, we're off to Amsterdam, Stockholm, Hamburg and Paris. But those will be short visits and we won't be able to absorb the places like we have London. We've been able to stay here awhile and have really enjoyed it, especially the access to culture. My wife went to the National Portrait Gallery the other day - she loves it there - and was telling me about how there's a portrait of the Queen next to one of Andy Warhol. She loved the juxtaposition of images. How do ice cream preferences in the UK differ from those in the States? Jerry: Our coffee flavours are very popular in the US, but we don't have a single coffee flavour here. Other flavours like Cookie Dough and Phish Food are equally popular on both sides of the Atlantic. But Cherry Garcia not so much. Perhaps it's because there's not as much of a subconscious connection with Grateful Dead guitarist Jerry Garcia, whom the flavour's name after. We've heard it called “Cherries Garcias” here. When can Londoners get their hands on your fairtrade ice creams? Jerry: Now! Already our Vanilla, Vanilla Toffee Crunch, Chocolate Macadamia and Chunky Monkey flavours are Fairtrade certified. And we're introducing a new Fairtrade flavour, Fairly Nuts. By the end of May this year, 60% of our products will be 100% Fairtrade certified. By the end of next year, you won't be able to buy Ben & Jerry's ice creams that aren't 100% Fairtrade certified.